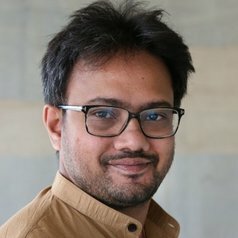 My research lies at the interface between developmental psychology, cognitive robotics, cognitive neurosciences and end user cognitive technologies, and investigates multiple topics related to action, skill, affordance, memory and goal directed reasoning in the context of both the brain and cognitive machines. A central challenge for brain science today is to ‘causally and computationally’ correlate the complex behaviors of animals to the equally complex activity in their brains. Here, robots are valuable research tools (like modern day microscopes) providing a unique opportunity to reenact the incessant interplay between multiple “sensory, motor and cognitive” processes from the perspective of an integrated system: that perceives, acts, learns, remembers, reasons, makes mistakes. In simple terms, while trying to make our robots act intelligently in a complex unstructured world, we engineers are attempting to solve the same problem that the brain solves to make ourselves act intelligently in similar situations! The value of such research is both intrinsic (understanding our own selves) and extrinsic i.e creating a range of cognitive machines, robotic artifacts that can meaningfully assist us in the environments we inhabit and create, untimately enhancing the quality of life. In this context, through several interlinked playful experiments on iCub humanoid inspired by infant and animal cognition (see figure), the ongoing research activity explores the computational basis of organization of action, learning and memory in cumulatively developing systems (humans and humanoids), while both strongly connecting to emerging trends in neurosciences and exploiting the developed framework in application domains.